Blending the pre-Flashpoint Superman and Lois Lane with the New 52 world should have been a mess. Although Superman was grandly killed off, we were left with two Lois Lanes, the public revelation that Superman was Clark Kent, and a child of the pre-Flashpoint couple. Somehow, this potential mess has turned into one of the most enjoyable Superman arcs in quite a while, and the storyline that begins in Action 965, “Lois Lane, Back at the Planet,” is a complete delight. Lois is, as one might assume, the central character in this tale. Now that her son is old enough to be attending school, she is wanting to go back to work. This is further spurred on by a mysterious letter she received from the New 52 Lois Lane. 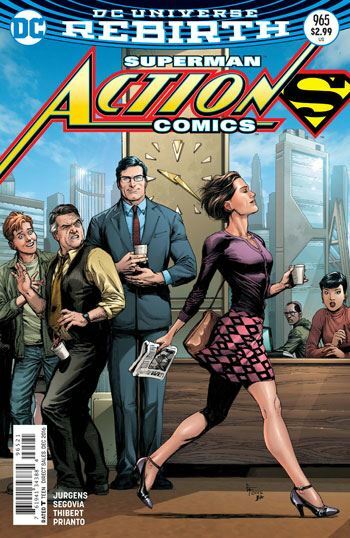 So Lois Lane heads back to the Daily Planet, but not her Planet. Lois encounters people she instantly recognizes, new reality or no. It’s always great to see Steve Lombard, and I was very happy to see Allie as well, two very strong and distinctive characters who really flesh out the work environment. Not everything goes smoothly, though, and Lois finds there are a few differences between her and her doppleganger. This storyline also keeps the mystery of the new Clark Kent on low boil. Lois has to interact with this man, who is not her husband, and apparently not even the doppleganger of her husband, and has no real idea how to relate to him. I’m glad they are taking their time with this plot thread. The more they use this Clark, the more “real” he becomes, and it’s impossible to foresee where this arc will be going. Perhaps because Thibert is doing the inks, this really looks like a jump back to the pre-Flashpoint Superman as well. For a story in which there is little dynamic action, there is plenty of variety and creativity in the art.